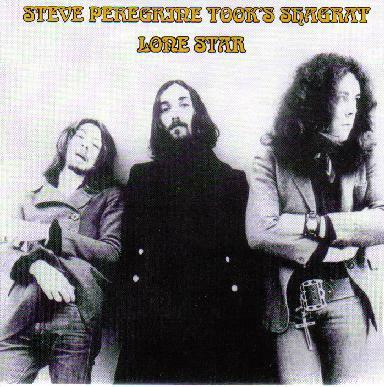 Steve Peregrine Took's Shagrat - "Lone Star"
If you're not familiar with the name Steve Peregrine Took, he was the other half of the duo of Marc Bolan's T.Rex's first couple of albums. I don't believe Took ever released an 'actual' LP. This release, like his two others, is a compilation. Seven tracks were recorded between April, 1970 to 1971. The first four cuts are acoustic songs, "Amanda", "Strange Sister", "Still Yawning, Still-Born" and "Beautiful Deceiver". The sound quality of these songs is very good. The three remaining tunes are what I dug the most about Lone Star. First there's "Peppermint Flickstick", a totally hip psychedelic number with great guitar riffs, the straight-ahead rocker "Boo! I Said Freeze" and "Steel Abortion", which to me sounds like a semi-rough (but listenable) Pink Fairies demo. Certainly no masterpiece here, but if you're a collector, completist or a die hard fan of lesser known psych, then you should get something good out of this CD. Personnel: Steve Peregrine Took - guitar, acoustic guitar & vocals, Larry Wallis - bass & backing vocals, Dave Bidwell - tambourine and Phil Lenoir - drums. Even though Took passed on in 1980, I've wondered what sort of music he might've made since then. Last I heard of him was that Nik Turner had him in the Inner City Unit as a sit-in bongo player. Might possibly appeal to some fans of the Deviants, Pretty Things, Syd Barrett and the Ramones.